Well, it’s a lazy Sunday afternoon in the Shenandoah Valley. I’m sitting on my front porch, watching Brayden ride his scooter down our driveway and Sophie is putting gas in her Little Tikes car. It’s a cool 72 degrees…good day!! I was really excited to see this one, because all of the dresses I’ve made for Sophie so far haven’t had sleeves. Now that fall is in the Valley, I was wondering what type of dress I could make her…I’m nowhere near ready to attempt sleeves. This looked like the perfect project for me! So, first of all, I was really confused by the measurements. It’s not the tutorials fault…probably my own comprehension problems. Anyway, after reading, reading some more, and re-reading, I came up with some measurements that I thought would work. My first problem was I couldn’t find a onesie in a 3T size. That’s ok with me…I love onesies for babies, but not so much for toddlers. So, I found a really cheap shirt at Wal-Mart ($3.88). Then, I bought the amount of fabric that the tutorial called for. What I found out when I got home, was that she probably put those measurements on the tutorial because it was for a baby’s onesie. 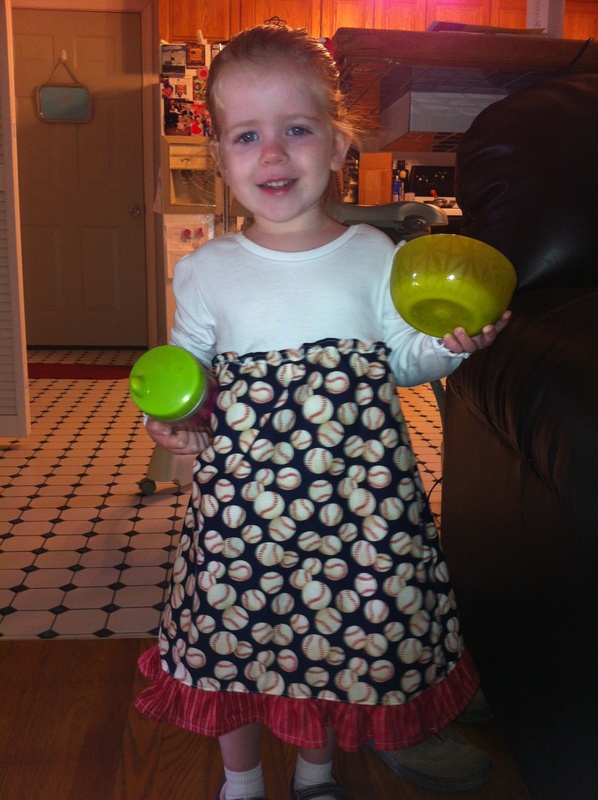 If you make it for a toddler, you will most likely need more than 1/3 yard for the skirt & 1/4 yard for the ruffle. Although I tried to measure the best I could, I think I ended up with too much fabric around. Don’t get me wrong, the dress is really cute…it’s also really full! However, if I make another dress (and I probably will, because I bought 2 shirts, the other is purple), I have a couple of things I will do differently. First: I will use a little less fabric around (width). I think I will cut a couple of inches off my initial measurements, so that should eliminate some of the fullness of the skirt. Second: I have learned that I despise making ruffles. I follow the directions. I’ve watched YouTube videos, read tutorials. I’m just not really good at it. So, to fix those issues, what I think I’ll do differently is combine this dress with the pillowcase dress (see my earlier article, titled “Pillowcase Dress”). 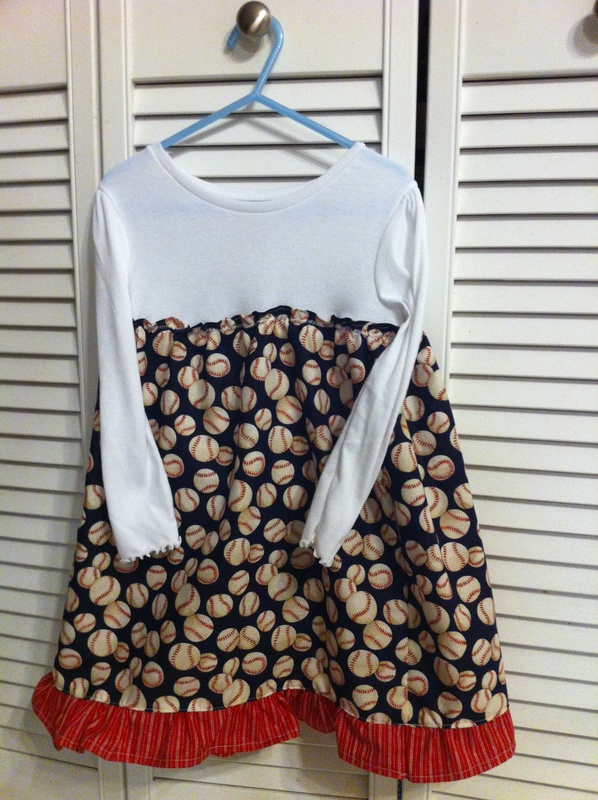 I will make the skirt part like the pillowcase part of the dress. Then, I will add the elastic to the top (or unfinished) part of the skirt and sew it on the shirt, like this tutorial says to do. I will add a band to the bottom of the skirt, but will lose the annoying ruffle. The possibilities for this dress are endless. You can make it for a baby by using a onesie. You can make it for a toddler by using a regular shirt. You can do all sorts of fabric color combinations. You can add ribbon, buttons, or other embellishments to make it your own. Other than having to make the ruffle, and sewing the skirt on the dress was a little tricky, overall, the project was pretty easy…I’d give it a rating of “medium” difficulty. Maybe it was just medium for me, who knows?? 🙂 Cost wise, it’s pretty inexpensive. If you make it with onesies, you can get a pack of 3 or more and those range from $5 or $6 and up. If you get the pack, you’ll get several dresses out of it, so the costs really go down.